284 people in our community are currently praying with you. They went out from us, but they were not of us; for if they had been of us, they would have continued with us. But they went out, that it might become plain that they all are not of us. But you have been anointed by the Holy One, and you all have knowledge. From the first, there have been challenges for evangelists: People denied Christ when He was alive, and after He died, arose, and ascended, people continued to deny Him, as they do today. This is and was the basic battle of Chrisian missions, bringing the gospel to people who did not know it or had not accepted it, that they might find Christ and eternal life in Him. Then came the problem of backsliding, that is, people who had been saved suffering from a lapse of faith. But now, John finds, a new problem had arisen. He began to hear people who had been saved but then went wrong, not by simply lapsing into the world of the flesh, but by perverting and misrepresenting the truth, making up stories that they presented as the word of God, but which would lead listeners back into the darkness. In John we encounter the term "antichrist" for the first and only time. Our understanding of the term has been distorted by Hollywood, which has co-opted The Antichrist as a caricature for horror movies. The Bibilical use is less colorful. John invented the term to describe Christians who stray from the truth, or people who simply invent some warped version of Christianity, and try to convince others to join them. They find Christ but then lose Him, by grafting onto His gospel ideas from their own, often insane, minds. Many such false teachers were beginning to appear towards the end of the first century. Of course, they have been with us ever since, and we still have them today. John calls the appearance of these false teachers the herald of "the last hour". He does not mean that the end of the world is coming next week. God's revelation to, and salvation of, mankind has come in stages or epochs, and the appearance of antichrists is the final epoch. There was the epoch of Adam and Eve; the epoch of Noah; then Abraham, when the first covenant was established; then Moses when the law was established; then the establishment and history of Israel; then Christ; and then, after Christ had ascended, the era of spreading the gospel. Now, we are in the last era, the final hour. God has made salvation available to all nations, so that all might be saved. He has given us a final battle, the battle against those who would pervert Christ's word. However long it may take, we are in the final stage of man's relationship with God. The antichrist is with us, in the form of aggressive atheism and perverted ideas about God. 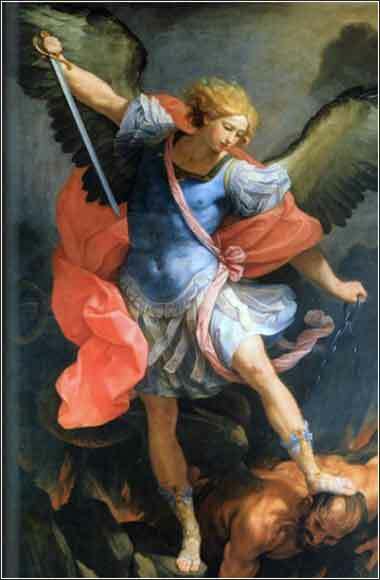 The Archangel Michael by Guido Reni, c. 1636.